The Alexander Technique allows the release of bodily tension which is held in the muscles and which can cause significant physical problems and pain. When practicing the Alexander-Technique you will learn to release this stress and to overcome habits of tension-causing "use" of your body. The Alexander-Technique teacher supports the student in developing a more "body-friendly" use of the body so that the joy of moving freely can be experienced again, a joy which most of us have experienced as children. Musicians, dancers, actors but also all of us who sit in front of a computer or do any repetitive movements profit from the Alexander Technique: They train a sustainable way of "using their body", renewing constantly its energies and consequently boost their performances in whatever activity they carry out. Sylvia graduated in 1983 as one of the first teachers of the F.M. Alexander Technique in German after three years of intensive study with over 1600 training hours. Many years later, when she lived in Switzerland she was part of the board of directors of the Swiss Society of Teachers of the Alexander Technique (SVLAT) and was responsible for maintaining the high quality status of training in the Swiss schools for the Alexander Technique. The Alexander Technique for her is a pillar in her Mind-Body coaching to support her clients letting go of stress on the physical and on the emotional level so that they can find back to equilibrium, peace and joy. The photo of the left shows a student before the AT session. Notice the body alignment. The body is too much forward which causes a strain on the knees and the lower back. The photo above shows the student after a Alexander Technique lesson. Her body is totally aligned. The ear is on the same line like the ankle. "I am a huge fan of the Alexander Technique, and I was so delighted to discover Sylvia was offering lessons here in Naples. I grow a little bit with every lesson. I particularly appreciate Sylvia's buoyant energy and sunny humor." I found the Alexander Technique after experiencing some repetitive stress pain after about 15 years of playing various string instruments. To say I was worried about my career would be an understatement. After the first meeting with Sylvia, the anxiety & worry began to melt away. I found that pain really wasn’t the enemy & began to learn how to work with it & not through it. I must say it was incredibly interesting and also humbling to realize that she could see what I could not. Sometimes we need some help! Realizing that was huge & cleared a new path for me. I think the Alexander Technique is a wonderful tool: It helps us to learn, understand, & grow as opposed to a quick fix through massage or chiropractic. After spending considerable time with books & podcasts concerning the A.T. I have found that there is nothing quite like meeting with an expert teacher. Sylvia is just that. I’m truly grateful to have met her & would recommend her to anyone seeking to understand how ease & movement can one. 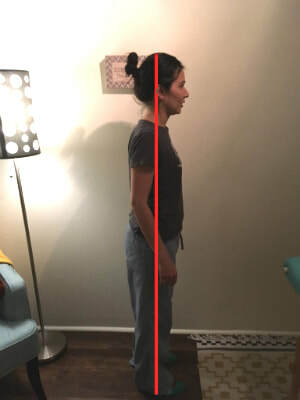 When I noticed that years of repetitive poor movements - while working at the computer - and general bad posture were starting to take a toll with neck strain and headaches and after moving to Southwest Florida, it was been a huge blessing to find Sylvia teaching in the area! ​Sylvia is extremely knowledgable about the mind-body connection and she has a gentle and joyful approach to the lessons. Sylvia's teaching style and insights have made it easier for me to slowly unlearn some bad habits and reinforce/realign myself to a more natural and efficient way of moving and thinking. Additionally, Sylvia offers lessons in other complimentary activities such as rebounding and self-inquiry. I'm looking forward to continuing to work with Sylvia as she guides me along this exploratory journey. I highly recommend her lessons to anyone looking to learn! Alexander Technique for Musicians experiencing pain like wrist pain, back pain, pain in the neck, headache. 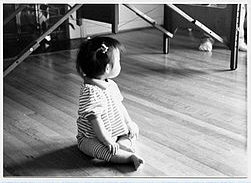 As a child each of us had an excellent use of the body. This knowledge is still in us. Through the Alexander Technique we re-access this knowledge. In this regards re-education is "dropping the behavior that sits on top of" our inherent excellent use of the body, that what we practiced as a child. 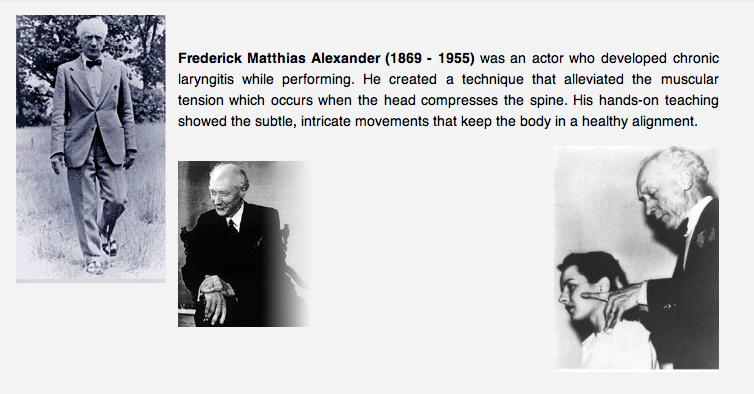 Coordination and poise rely on the natural balance of the head, neck and back, what F M Alexander called “the primary control”. 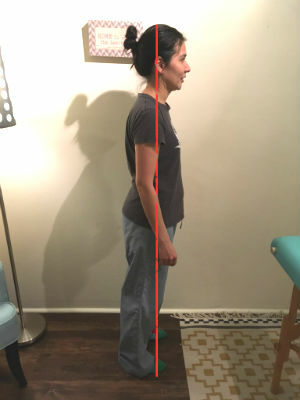 The Technique works through re-establishing this natural balance to promote easy upright posture and efficient functioning, body and mind. The Alexander Technique is a subtle and thoughtful discipline, but essentially practical and problem-solving. The Technique teaches us the skillful "use of the body", i.e. how we use the body when moving, resting, breathing, learning, organizing our awareness and focus of attention and, above all, choosing our reactions to increasingly demanding situations. Changes brought about by good habits of diet and exercise are well understood. The long-term effects of good habits of the "use of the self" are less well known, but equally life-changing. You learn to become aware of, and then gradually strip away, the habits of movement, tension and reaction that interfere with natural and healthy coordination.